Campers bunk in either cabins, yurts or platform tents with 6-10 other campers, and two counselors. 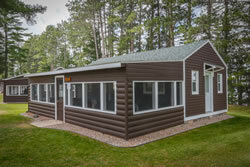 Campers are assigned by age, grade and gender with younger groups starting in deluxe cabins progressing to older groups in platform tents. Our KYBO is a modern washroom facility centrally located. Yurts are a self-supporting round, domed shelter used by nomadic tribes across central Asia. Traditional yurts are constructed of a circular wooden frame with a felt cover. Our yurts have a door frame, lattice wall sections, roof poles and a crown. You may think “tent” when you see a yurt. 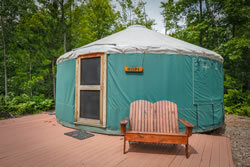 However, yurts are much stronger due to their circular structure combined with wood frame and durable fabric cover. Campers eat most meals with their cabin group in our Dining Hall. They will take turns being Hoppers (those who help with setup and cleanup of the cabin table). Our menu is nutritionally balanced and designed to appeal to most appetites. Along with meal entrees, we have a full cereal bar at breakfast and a salad bar at lunch and dinner.